Australian master brewer Dr. Charles ‘Chuck’ Hahn first established the Hahn Brewery in the suburb of Camperdown in Sydney, in 1988. Though he continues to produce beer of the highest quality to this day, his older creations, like Hahn Super-Dry, still stand up. Hahn Premium Super Dry pours a bright straw colour with a light, grainy aroma. Taste is pleasantly dry, with grassy notes and a crisp finish. Its low carb count and full strength give it the best of both worlds. This lager is super refreshing, and best enjoyed cold. This beer is so low in carbs you actually lose weight whilst drinking it, gonna put me another order in! This is a Dry Low Carb beer, perfect drink to enjoy on a hot afternoon with a BBQ. I visited Australia last year. I couldnt find a beer I liked as Im from the US. I finally found Hahns Super Dry ! I LOVE IT ! 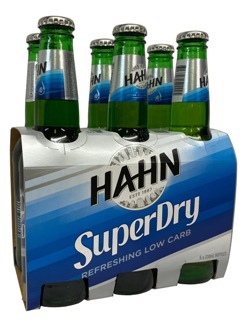 Im trying to get it delivered as they do not sell it in the US.I dont know if I can get it delivered here but I LOVE HAHNS SUPER DRY !